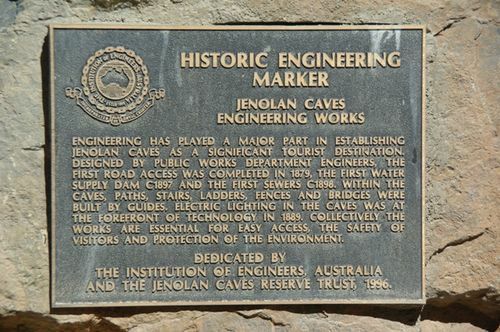 Historical Engineering Marker is dedicated to the part that engineering played in the development of the Jenolan Caves. ENGINEERING HAS PLAYED A PART IN ESTABLISHING JENOLAN CAVES AS A SIGNIFICANT TOURIST DESTINATION. DESIGNED BY PUBLIC WORKS DEPARTMENT ENGINEERS, THE FIRST ROAD ACCESS WAS COMPLETED IN 1879, THE FIRST WATER SUPPLY DAM C1897 AND THE FIRST SEWERS C1898. WITHIN THE CAVES, PATHS, STAIRS, LADDERS, FENCES AND BRIDGES WERE BUILT BY GUIDES. RLECTRIC LIGHTING IN THE CAVES WAS AT THE FOREFRONT OF TECHNOLOGY IN 1889. COLLECTIVELY THE WORKS ARE ESSENTIAL FOR EASY ACCESS, THE SAFETY OF VISITORS AND PROTECTION OF THE ENVIRONMENT. DEDICATED BY THE INSTITUTION OF ENGINEERS, AUSTRALIA AND THE JENOLAN CAVES RESERVE TRUST 1996.